After a fairly good start to my project pan, I feared that February was going to be a really slow month in terms of progress. As we went through the short month products just kept coming to an end, especially given using certain products increasingly became part of my routine. Product usage still is not quite at the point in my routine where I want it to be. Some things are still hit and miss or others only happen every couple of days instead of daily but everything is slowly moving in the right direction and that is allowing me to work through products and see reasonable enough progress. I have been making sure that a bath is something that I can fit into my routine at least a few days a week. This not only helps me to get through things like the large quantity of bath bombs I have, as well as letting me use some shower gel that lathers well as a bubble bath, but also it helps me to relax and have some me time whilst also making progress on removing excess products from me life (which is extra me time ultimately). 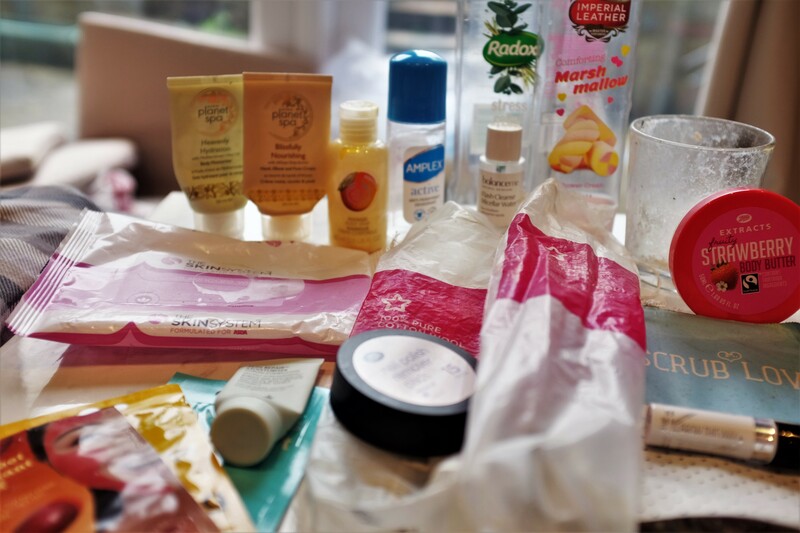 Whilst I knew I carried on managing to finishing products throughout the month it was still a bit of a surprise when I looked at the box of items to do this post and found out just how full it actually was of products rather than it just being a small handful of big and bulky items. Some things, such as bath bombs, have been used up and other than showing you some plastic wrap that has no name or indication of the product there is nothing to indicate those coming and going from my life. If you seen my Instagram post a little while ago though you will have an idea of just how many bath bombs I started the year with (over 60) but I am currently down to around 45 (I know, still a mammoth number). Avon’s Planet Spa Blissfully Nourishing hand, elbow and foot cream. I love the scent of this product and had a whole tub of it in the past. It doesn’t soak into my skin super well though. Avon’s Planet Spa Heavenly Hydration body moisturiser. This product was getting on a little bit in age and whilst the application was as you would expect it just didn’t soak into the skin super well. The Body Shop mango body whip. I love the mango scent but prefer the mango body butter. Amplex active roll on deodorant. This stuff didn’t have a scent which was great and it did the job fairly well but the liquid itself was initially sticky underarm which isn’t great. Radox Stress Relief bath soak. The scent of this is fantastic and a little goes a long way in producing bubbles. Imperial Leather Marshmallow shower cream. Smells great but the lather is fairly poor. Balanceme Micellar Water. I didn’t feel like this stuff did anything other than dry my face out a little after use. My face really didn’t feel any cleaner afterwards. Superdrug cotton wool pads. I happened to finish two packets of these at the same time because of them being in two different rooms with different purposes. They did the job. SkinSystem for Asda face wipes. I don’t use these on the face that often. More just for cleaning up any makeup mess around me but when I do use them on the face as a freshener at the start of the day they do a decent job. Boots nail polish remover pads. These things not only stunk but also were super oily and horrible to use. Would not recommend, even in a pinch. Liz Earle moisturiser. This has a great scent, is gentle to the skin and soaks in really well. This is one of the products that helps me to notice such a big difference to my face when I use it. Face masks. 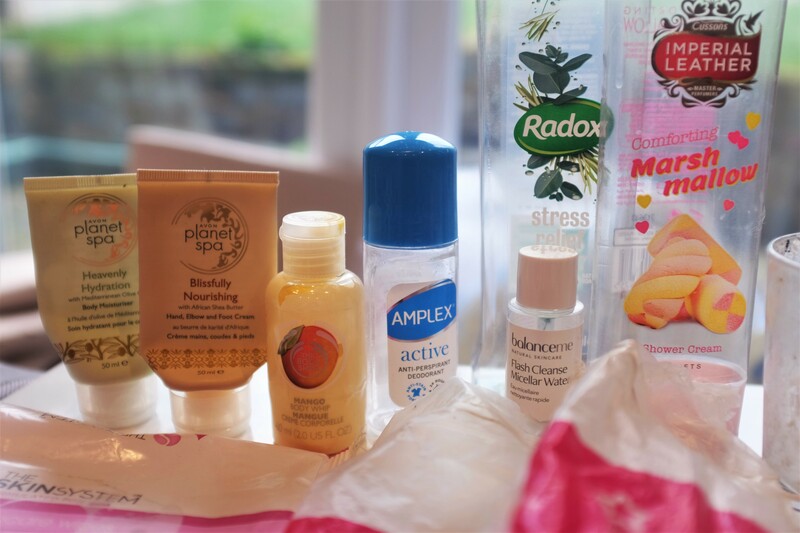 The Anatomicals face masks have already been discussed here on the blog and the Superdrug one was pretty average. Scrub Love coffee scrub. I hate coffee and the smell of it so this stuff took a lot of effort for me to use. Whilst it removed dead skin on the face it also clogged the pores up. I would suggest you stick to using it on your legs. Rimmel clear eyebrow gel. This could be applied lightly and help set the brows without leaving them crunchy or overly shiny. Boots Extracts strawberry body butter. It was not quite as thick as a lot of body butters I have used so it didn’t feel super hydrating on the skin. Sixth Scent candle. I have a couple of other soy candles left from this brand and I would not hugely recommend. They burn unevenly, do not give off much of a scent and actually seem to give me a bit of a headache when I burn them. Some perfumes just seem to just go on and on and despite me using the same one pretty much every day there seems to be such little progress in the one that I am currently working on. At the start of the February it was exactly on the half way line and it has perhaps gone down a mm at most… will it ever end? I am increasingly unsure but really hope to wake up one day and see some magical progress on it. It is really easy to get the use it up bug. The way that I find it easiest to use products and feel motivated to do so is to find declutter videos or updates on people’s project pans on YouTube to watch when I am getting out of the bath. Due to the standard UK size of our bathroom I have to do my creams and lotions in the bedroom so having a video to pop on really gives me something to focus on as I grab a blob of body butter. Sometimes they even encourage me to re-organise everything I have in a way that makes it look a little bit more manageable and less overwhelming too. I knew I had a lot of stuff but this month I have really sat there staring at everything just thinking “how did I end up with so much stuff? Have I really been suckered in to buy things because of there being a sale on in that shop that has a sale on 70% of the year?”. Thinking that has also encouraged me to think about a lot of things more before I purchase them such as “do I really want to grab this £1 snack or can I wait until I get to my destination to grab something more proper?” and “do I actually need some new socks or is it just I am bored of the ones I have?”. It turns out that, despite my political viewpoint, I got sucked into the life of consumerism. Erg. Doing my nails is something that I have fallen off the bandwagon with a little over the last month. I have done my nails a few times but when I have a moment to just sit down and relax I am usually too tired to stare closely at my hands to try to get a semi-respectable looking manicure. Hopefully over the next couple of months I am going to get back into scheduling things in my diary and including the kind-of-mundane stuff like doing my nails because otherwise I am missing a chance to hold myself accountable. Part of me wants to get another candle used up by the end of the month but a lot of my currently on the go candles are quite large and that might be a little unrealistic. This is made worse by the fact that I have several candles on the go in a number of rooms instead of just focusing on one in each room at most. I want to really focus on using one of my tiny pots of Sleepy body cream from Lush as I tend to only use it, on my collarbones and wrists mainly, when I am feeling super anxious and tetchy on the approach to bed time. It is a great product and it would be largely beneficial for me to use it on a daily basis just to ensure I am always on a calm and relaxed level when I want to get settled in bed instead of taking any risks. If you are doing a project pan how are you getting along? Have you made any realisations in the last month? Let me know in the comments below! 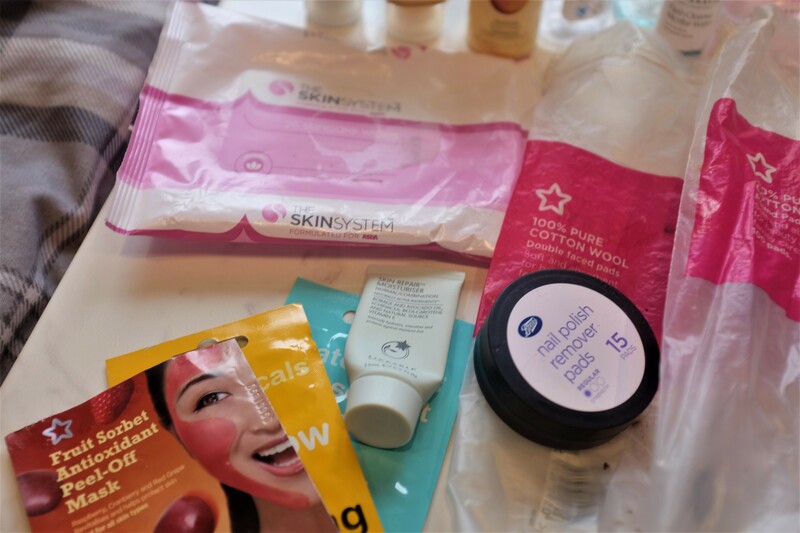 This entry was posted in Beauty, Declutter/Empties, Empties/Declutter, Lifestyle and tagged bblog, bblogger, bbloggers, Beauty, beauty blog, beauty blogger, beauty bloggers, beauty products, beauty review, body, body cream, candles, declutter, empties, face, hands, lblog, lblogger, lbloggers, life, Lifestyle, lifestyle blog, lifestyle blogger, lifestyle bloggers, nails, product review, project pan, project use it up, review, skin, use it up. Bookmark the permalink.